By using Instagram Video Downloader you can download videos and photos from Instagram on your directly to your (iPhone, Android device, Pc or Mac) 100% FREE. All you have to do is just copy URL of video or photo (Image) from instagram then paste it in the above input text box. You can download Instagram videos & photos with just one click. Save & download videos and photos in their original resolution & quality. 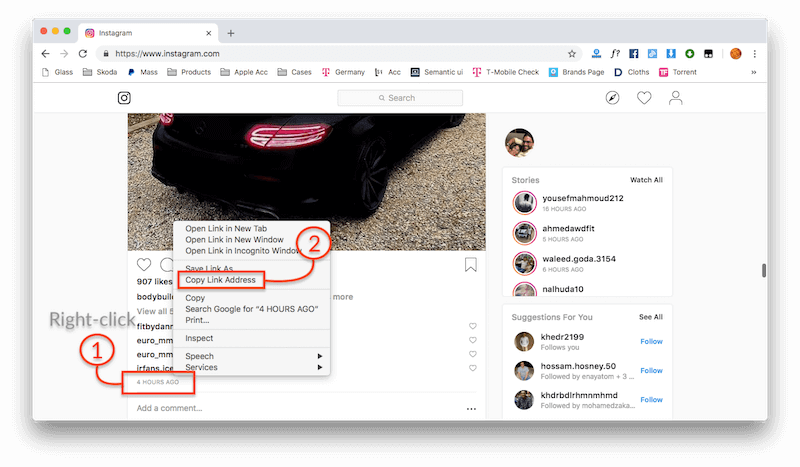 Save & download instagram videos from private accounts. Note: The video or photo which you will download must be from a public Instagram account. But you still able to download videos and photos from private instagram accounts. Just click here. Step 1: Copy video or photo’s URL from your browser or Instagram app. Tap (iOS) or (Android) above the post and then tap Copy Share URL. The link will be saved to your clipboard. Right-click on the date of the video or photo on Instagram then click "Copy Link Address"
Step 2: Paste URL in the above text box area. Does Instagram Video Downloader needs any money after some Downloads limit? this service is Totally Free and has no limit to download. Where my videos saved after download?